Eric Wood was a first alternate for this year’s Pro Bowl, meaning if a “starter” for the Pro Bowl bows out due to injury or some other reason, he could participate in this year’s game. Wood in an interview on SiriusXM NFL Radio said he’s already been put on stand by. Pouncey was questionable heading into last week’s playoff game with a hip injury. At this year’s Pro Bowl, the NFL will host the NFL Flag Championships, powered by USA Football. Held at ESPN Wide World of Sports on Friday, Jan. 27 and Saturday, Jan. 28, the competition will feature a total of 64 teams from around the nation. Broken down into eight regional championships in four divisions, the winning teams each earned a trip to Orlando to compete in the big event. 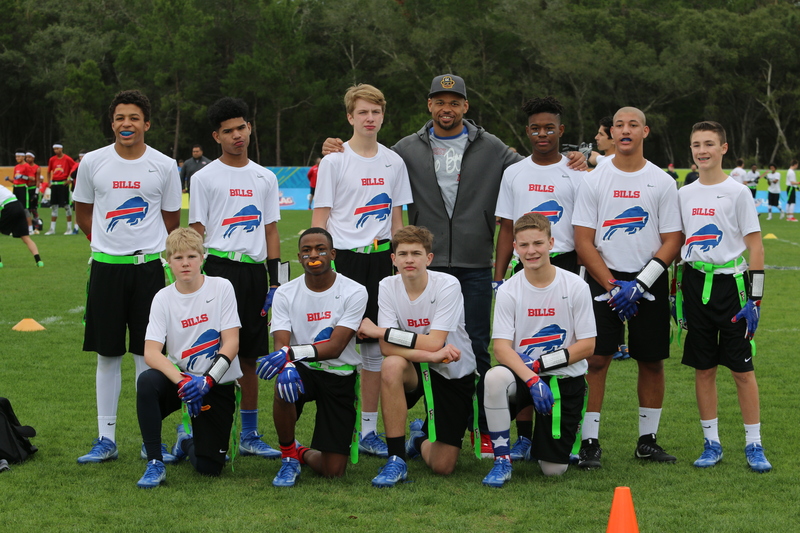 Additionally, 32 teams were selected by each of the NFL’s clubs to represent them in the 13-14 Boys division. Stopping by to show his support for Buffalo’s bunch, and to offer some tips for success, was Pro Bowl linebacker Lorenzo Alexander. Richie Incognito made the Pro Bowl outright last season. This year he came close again. Incognito confirmed Thursday that he’s a first alternate for this year’s NFL all-star game. Other Bills who confirmed their Pro Bowl alternate status were Kyle Williams (1st alternate), Jerome Felton (2nd alternate), Stephon Gilmore (2nd alternate), Brandon Tate (2nd alternate), Zach Brown (3rd alternate) and Tyrod Taylor (3rd alternate). As a Pro Bowl alternate you can still play in the game if a Pro Bowl starter is unable to play due to injury or pulls out of participating in the game. The polls are open for Pro Bowl voting. Starting today, fans may vote to select players for the 2017 Pro Bowl to be played on Sunday, January 29, 2017 at Camping World Stadium in Orlando, Florida and televised live on ESPN. Voting is available online and on web-enabled mobile phones by going to NFL.com/probowlvote and will be open through Tuesday, December 13. Bills CB Stephon Gilmore is entering a contract year though the club hopes to sign the talented cornerback to a long-term contract extension before next spring’s free agent period. If Gilmore has the season NFL.com predicts it could prove good for Gilmore and the Bills. NFL.com put together a list of nine players they see performing so well in 2016 that it will vault them to their first career Pro Bowl nod. Gilmore made the list coming in at number six. 6. Stephon Gilmore, Buffalo Bills cornerback: Ronald Darby, Gilmore’s tag-team partner, is also a good candidate for his first Pro Bowl after finishing second in the Defensive Rookie of the Year voting. Still, it seems wrong for Darby to make it before his veteran teammate who also plays a physical style. The Pro Bowl has been moved from its traditional home of Honolulu, Hawaii’ at Aloha Stadium before. Now it appears the NFL’s all-star game will be moving again. According to NFL.com, the 2017 Pro Bowl will be held in Orlando, Florida. It’s reportedly part of a multi-year deal to stay in central Florida. No word on whether there will be any format changes, with NFL legends Jerry Rice and Michael Irvin “drafting” their Pro Bowl squads. Florida has hosted the Pro Bowl before, when it was held in Miami Gardens in 2009. In the wake of the Pro Bowl draft all three representatives from the Bills were selected to the same squad. Richie Incognito, Tyrod Taylor and Eric Wood were all selected by Team Rice on Wednesday night. By the looks of the lineup it appears that Incognito will start at left guard. Taylor and Wood will hit the field Sunday night as subs. The other interesting aspect of the Pro Bowl is all of the quarterbacks will be mic’d up live for the game. So when Taylor gets in the game you’ll be able to hear him interacting with teammates in the huddle and at the line of scrimmage. Here’s a look at the Team Rice roster, which includes Buffalo’s three Pro Bowl reps. The Pro Bowl airs Sunday night at 7 pm on ESPN. Prior to signing with the Buffalo Bills, Richie Incognito was a former Pro Bowl guard who saw his contract terminated by his team (Miami) in the wake of a bullying scandal. Two years later, Incognito successfully reclaimed his status as a Pro Bowl caliber player and proved to be a model teammate and leader in Buffalo’s locker room. Bills GM Doug Whaley told Buffalobills.com that seeing Incognito headed back to the Pro Bowl speaks volumes about how far the veteran lineman has come. Whaley also said that the front office will get the ball rolling on preliminary discussions about a new contract for Incognito, who becomes an unrestricted free agent in March. Bills Pro Bowl center Eric Wood, who was named to the Pro Bowl roster officially on Monday as a replacement for Carolina C Ryan Kalil, talked about the parts of the offense that he felt helped his case as a Pro Bowl caliber player this season. He also shared a team goal that the offensive line already has on the docket for 2016. Finishing tops in the league in rushing and having a quarterback with the seventh-highest passer rating in the NFL were both good reflections on Wood’s play as he saw it. Eric Wood and Tyrod Taylor are both headed to the Pro Bowl as replacements for Carolina Panthers Ryan Kalil and Cam Newton as both of them are advancing to the Super Bowl. Wood and Taylor are all too happy to step in, but their travel schedule just got a lot more hectic this week. Both Taylor and Wood are flying to Hawaii Tuesday morning and will begin preparations for the game not long after their land in Honolulu. The league informs the Pro Bowl alternates what has to occur in the NFL playoffs to get their opportunity to play in the Pro Bowl. Bills RB LeSean McCoy was Buffalo’s lone Pro Bowl representative, but he pulled out of the league’s all-star game this week. McCoy missed the last two games of the regular season due to a knee injury, and after a season that was largely compromised by injury Buffalo’s feature back chose to bypass the game in Hawaii. He’ll be replaced by Jets RB Chris Ivory. This is not the first time McCoy has chosen to skip the Pro Bowl. He bypassed the game last year as well due to injury. Right now the Bills do not have a Pro Bowl representative scheduled to play in the game, though Richie Incognito, Eric Wood, Tyrod Taylor and Marcell Dareus are all Pro Bowl alternates. Three Bills Pro Bowl defensive linemen are already on site in Glendale, Arizona for Sunday’s game. They’re also participating in some community events this week. Mario Williams, who has a great affinity for the armed forces and law enforcement, spent some time with airmen from the US Air Force. 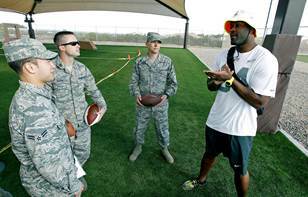 Williams took the time during the Airman for a Day event that was sponsored by USAA, the Official Military Appreciation Sponsor of the NFL. Pro Bowl players got to get up close and personal with an F-16, try an F-16 flight simulator, meet with military working dogs (K-9 bomb/attack dogs) and participate in Skype calls with military members overseas, with their families stateside at Luke AFB. Three Bills players rank high at their respective positions in NFL Pro Bowl fan voting right now. Not surprisingly, they’re all on the defensive side of the ball. Buffalo’s defense has been stout all season long and the players on that unit are getting recognized for it. Leading all defensive tackles in fan votes is Marcell Dareus, thanks in large part to his 10 sacks in the first nine games. Also in the top five of fan voting at their positions are DE Mario Williams and CB Leodis McKelvin. Go to Buffalobills.com for details. It’s not a permanent move, but the NFL is shifting the Pro Bowl to Arizona next February. That according to CBSSports.com’s Jason LaCanfora, who tweeted as much Wednesday afternoon. In recent years the Pro Bowl has also been played in South Florida. With Marcell Dareus added to the Pro Bowl roster Monday it gives Buffalo three defensive linemen in one Pro Bowl for the first time in team history as he joins Kyle Williams and Mario Williams. It’s also the first time one NFL club has sent three defensive linemen to the Pro Bowl in the same year since 2008 when Minnesota sent Jared Allen, Kevin Williams and Pat Williams to Honolulu. Dareus also gives Buffalo four players at the Pro Bowl (Byrd, K. Williams, M. Williams). It’s the first time the Bills have had four players at one Pro Bowl since 2004 when they had DT Sam Adams, CB Nate Clements, KR Terrence McGee and LB Takeo Spikes go. The last time Buffalo came close to having three defensive linemen in the Pro Bowl in the same year was 1997 when Bruce Smith, Ted Washington and Bryce Paup all went, but Paup was a linebacker in Buffalo straight 3-4 system even though he was often at the line in a two-point stance. When Marcell Dareus came to the Bills as their third overall pick in 2011, he was all of 21-years old. The commitment to being a pro every single day was something the talented defensive tackle had to learn. Fortunately for him he had mentors in Kyle Williams and Mario Williams. It took until year three of his career for it to kick in, but Dareus prepared like a pro and it made him a more consistent player on the field. In an appearance on the John Murphy Show Monday after he was named as an injury replacement to the Pro Bowl, Dareus tipped his hat to his two veteran teammates and fellow Pro Bowlers. For the first time in three years Bills Pro Bowl DT Kyle Williams will enter the offseason with a clean bill of health. After back-to-back offseasons of Achilles surgery, Williams has no surgical procedures this winter. That has him confident that his ninth NFL season will be one that he’ll enter the healthiest come next spring. Bills head coach Doug Marrone lightened Williams’ practice load during the season with the intent to keep his veteran DT from over working the surgically repaired achilles. According to Williams the timetable for the achilles to be full strength went through to the end of the season. Williams is expected to play in the Pro Bowl on Jan. 26th. The Bills have three players from their roster who will be headed to Hawaii for the Pro Bowl, and all three are returning players. Mario Williams, Jairus Byrd and Kyle Williams were all named to their third career Pro Bowls. It’s the first for Mario Williams with the Bills. This is also the first time three Bills defenders were named to the initial Pro Bowl roster since 1997 when Bryce Paup, Ted Washington and Bruce Smith were named starters.